CARFAX One-Owner. Clean CARFAX. Certified. Black Sand Pearl 2016 Toyota Corolla LE FWD CVT 1.8L I4 DOHC Dual VVT-iRecent Arrival! 29/38 City/Highway MPGToyota Certified Used Vehicles Details: * Limited Comprehensive Warranty: 12 Month/12,000 Mile (whichever comes first) from certified purchase date. Roadside Assistance for 1 Year * Vehicle History * Powertrain Limited Warranty: 84 Month/100,000 Mile (whichever comes first) from original in-service date * 160 Point Inspection * Roadside Assistance * Transferable Warranty * Warranty Deductible: $50Awards: * 2016 KBB.com 5-Year Cost to Own Awards * 2016 KBB.com Best Buy Awards FinalistWHY CHOOSE HAMER TOYOTA? SIMPLE - we choose volume sales over large profit margins! Serving the good folks of the San Fernando Valley from the same corner since 1939, we are in the TOP 10 IN THE USA on Certified Pre-Owned Toyotas and every pre-owned vehicle passes inspection or we don't sell it!! Our Service Department is filled with Toyota Master Technicians who care, our Parts Department is fully stocked, we offer a free shuttle during your service, and provide free wifi in our Customer Business Center. Buy from Hamer and receive a 15% Off Parts Card good for life! At Hamer Toyota, WE HEAR YOU! CARFAX One-Owner. Clean CARFAX. Certified. Slate Metallic 2016 Toyota Corolla L FWD 4-Speed Automatic 1.8L I4 DOHC Dual VVT-iRecent Arrival! 27/36 City/Highway MPGToyota Certified Used Vehicles Details: * Roadside Assistance * Warranty Deductible: $50 * Limited Comprehensive Warranty: 12 Month/12,000 Mile (whichever comes first) from certified purchase date. Roadside Assistance for 1 Year * 160 Point Inspection * Vehicle History * Powertrain Limited Warranty: 84 Month/100,000 Mile (whichever comes first) from original in-service date * Transferable WarrantyAwards: * 2016 KBB.com Best Buy Awards Finalist * 2016 KBB.com 5-Year Cost to Own AwardsWHY CHOOSE HAMER TOYOTA? SIMPLE - we choose volume sales over large profit margins! Serving the good folks of the San Fernando Valley from the same corner since 1939, we are in the TOP 10 IN THE USA on Certified Pre-Owned Toyotas and every pre-owned vehicle passes inspection or we don't sell it!! Our Service Department is filled with Toyota Master Technicians who care, our Parts Department is fully stocked, we offer a free shuttle during your service, and provide free wifi in our Customer Business Center. Buy from Hamer and receive a 15% Off Parts Card good for life! At Hamer Toyota, WE HEAR YOU! New Price! CARFAX One-Owner. Clean CARFAX. Certified. Frost 2018 Toyota Yaris iA FWD 6-Speed Automatic 1.5L DOHCRecent Arrival! 32/40 City/Highway MPGToyota Certified Used Vehicles Details: * 160 Point Inspection * Limited Comprehensive Warranty: 12 Month/12,000 Mile (whichever comes first) from certified purchase date. Roadside Assistance for 1 Year * Vehicle History * Warranty Deductible: $50 * Roadside Assistance * Transferable Warranty * Powertrain Limited Warranty: 84 Month/100,000 Mile (whichever comes first) from original in-service dateWHY CHOOSE HAMER TOYOTA? SIMPLE - we choose volume sales over large profit margins! Serving the good folks of the San Fernando Valley from the same corner since 1939, we are in the TOP 10 IN THE USA on Certified Pre-Owned Toyotas and every pre-owned vehicle passes inspection or we don't sell it!! Our Service Department is filled with Toyota Master Technicians who care, our Parts Department is fully stocked, we offer a free shuttle during your service, and provide free wifi in our Customer Business Center. Buy from Hamer and receive a 15% Off Parts Card good for life! At Hamer Toyota, WE HEAR YOU! Clean CARFAX. Certified. Black Sand Mica 2015 Toyota Corolla LE FWD CVT 1.8L I4 DOHC Dual VVT-iRecent Arrival! 29/38 City/Highway MPGToyota Certified Used Vehicles Details: * 160 Point Inspection * Powertrain Limited Warranty: 84 Month/100,000 Mile (whichever comes first) from original in-service date * Transferable Warranty * Limited Comprehensive Warranty: 12 Month/12,000 Mile (whichever comes first) from certified purchase date. Roadside Assistance for 1 Year * Warranty Deductible: $50 * Roadside Assistance * Vehicle HistoryAwards: * 2015 KBB.com 10 Best UberX Candidates * 2015 KBB.com 10 Tech-Savviest Cars Under $20,000 * 2015 KBB.com 5-Year Cost to Own Awards * 2015 KBB.com 10 Most Affordable CarsWHY CHOOSE HAMER TOYOTA? SIMPLE - we choose volume sales over large profit margins! Serving the good folks of the San Fernando Valley from the same corner since 1939, we are in the TOP 10 IN THE USA on Certified Pre-Owned Toyotas and every pre-owned vehicle passes inspection or we don't sell it!! Our Service Department is filled with Toyota Master Technicians who care, our Parts Department is fully stocked, we offer a free shuttle during your service, and provide free wifi in our Customer Business Center. Buy from Hamer and receive a 15% Off Parts Card good for life! At Hamer Toyota, WE HEAR YOU! CARFAX One-Owner. Clean CARFAX. Certified. Graphite 2018 Toyota Yaris iA FWD 6-Speed Automatic 1.5L DOHCRecent Arrival! 32/40 City/Highway MPGToyota Certified Used Vehicles Details: * Warranty Deductible: $50 * Transferable Warranty * Vehicle History * 160 Point Inspection * Limited Comprehensive Warranty: 12 Month/12,000 Mile (whichever comes first) from certified purchase date. Roadside Assistance for 1 Year * Roadside Assistance * Powertrain Limited Warranty: 84 Month/100,000 Mile (whichever comes first) from original in-service dateWHY CHOOSE HAMER TOYOTA? SIMPLE - we choose volume sales over large profit margins! Serving the good folks of the San Fernando Valley from the same corner since 1939, we are in the TOP 10 IN THE USA on Certified Pre-Owned Toyotas and every pre-owned vehicle passes inspection or we don't sell it!! Our Service Department is filled with Toyota Master Technicians who care, our Parts Department is fully stocked, we offer a free shuttle during your service, and provide free wifi in our Customer Business Center. Buy from Hamer and receive a 15% Off Parts Card good for life! At Hamer Toyota, WE HEAR YOU! CARFAX One-Owner. Clean CARFAX. Certified. Slate Metallic 2015 Toyota Corolla S Plus FWD CVT 1.8L I4 DOHC Dual VVT-i S Plus Package.Recent Arrival! 29/37 City/Highway MPGToyota Certified Used Vehicles Details: * 160 Point Inspection * Transferable Warranty * Powertrain Limited Warranty: 84 Month/100,000 Mile (whichever comes first) from original in-service date * Vehicle History * Warranty Deductible: $50 * Limited Comprehensive Warranty: 12 Month/12,000 Mile (whichever comes first) from certified purchase date. Roadside Assistance for 1 Year * Roadside AssistanceAwards: * 2015 KBB.com 10 Most Affordable Cars * 2015 KBB.com 10 Tech-Savviest Cars Under $20,000 * 2015 KBB.com 5-Year Cost to Own Awards * 2015 KBB.com 10 Best UberX CandidatesWHY CHOOSE HAMER TOYOTA? SIMPLE - we choose volume sales over large profit margins! Serving the good folks of the San Fernando Valley from the same corner since 1939, we are in the TOP 10 IN THE USA on Certified Pre-Owned Toyotas and every pre-owned vehicle passes inspection or we don't sell it!! Our Service Department is filled with Toyota Master Technicians who care, our Parts Department is fully stocked, we offer a free shuttle during your service, and provide free wifi in our Customer Business Center. Buy from Hamer and receive a 15% Off Parts Card good for life! At Hamer Toyota, WE HEAR YOU! CARFAX One-Owner. Clean CARFAX. Certified. Graphite 2018 Toyota Yaris iA FWD 6-Speed Automatic 1.5L DOHCRecent Arrival! 32/40 City/Highway MPGToyota Certified Used Vehicles Details: * Roadside Assistance * Vehicle History * 160 Point Inspection * Warranty Deductible: $50 * Transferable Warranty * Limited Comprehensive Warranty: 12 Month/12,000 Mile (whichever comes first) from certified purchase date. Roadside Assistance for 1 Year * Powertrain Limited Warranty: 84 Month/100,000 Mile (whichever comes first) from original in-service dateWHY CHOOSE HAMER TOYOTA? SIMPLE - we choose volume sales over large profit margins! Serving the good folks of the San Fernando Valley from the same corner since 1939, we are in the TOP 10 IN THE USA on Certified Pre-Owned Toyotas and every pre-owned vehicle passes inspection or we don't sell it!! Our Service Department is filled with Toyota Master Technicians who care, our Parts Department is fully stocked, we offer a free shuttle during your service, and provide free wifi in our Customer Business Center. Buy from Hamer and receive a 15% Off Parts Card good for life! At Hamer Toyota, WE HEAR YOU! CARFAX One-Owner. Clean CARFAX. Certified. Black Sand Pearl 2016 Toyota Corolla LE FWD CVT 1.8L I4 DOHC Dual VVT-iRecent Arrival! 29/38 City/Highway MPGToyota Certified Used Vehicles Details: * Warranty Deductible: $50 * 160 Point Inspection * Limited Comprehensive Warranty: 12 Month/12,000 Mile (whichever comes first) from certified purchase date. Roadside Assistance for 1 Year * Transferable Warranty * Powertrain Limited Warranty: 84 Month/100,000 Mile (whichever comes first) from original in-service date * Roadside Assistance * Vehicle HistoryAwards: * 2016 KBB.com 5-Year Cost to Own Awards * 2016 KBB.com Best Buy Awards FinalistWHY CHOOSE HAMER TOYOTA? SIMPLE - we choose volume sales over large profit margins! Serving the good folks of the San Fernando Valley from the same corner since 1939, we are in the TOP 10 IN THE USA on Certified Pre-Owned Toyotas and every pre-owned vehicle passes inspection or we don't sell it!! Our Service Department is filled with Toyota Master Technicians who care, our Parts Department is fully stocked, we offer a free shuttle during your service, and provide free wifi in our Customer Business Center. Buy from Hamer and receive a 15% Off Parts Card good for life! At Hamer Toyota, WE HEAR YOU! CARFAX One-Owner. Clean CARFAX. Certified. Stealth 2018 Toyota Yaris iA FWD 6-Speed Automatic 1.5L DOHCRecent Arrival! 32/40 City/Highway MPGToyota Certified Used Vehicles Details: * Roadside Assistance * Limited Comprehensive Warranty: 12 Month/12,000 Mile (whichever comes first) from certified purchase date. Roadside Assistance for 1 Year * Transferable Warranty * Powertrain Limited Warranty: 84 Month/100,000 Mile (whichever comes first) from original in-service date * 160 Point Inspection * Warranty Deductible: $50 * Vehicle HistoryWHY CHOOSE HAMER TOYOTA? SIMPLE - we choose volume sales over large profit margins! Serving the good folks of the San Fernando Valley from the same corner since 1939, we are in the TOP 10 IN THE USA on Certified Pre-Owned Toyotas and every pre-owned vehicle passes inspection or we don't sell it!! Our Service Department is filled with Toyota Master Technicians who care, our Parts Department is fully stocked, we offer a free shuttle during your service, and provide free wifi in our Customer Business Center. Buy from Hamer and receive a 15% Off Parts Card good for life! At Hamer Toyota, WE HEAR YOU! CARFAX One-Owner. Clean CARFAX. Certified. Slate Metallic 2016 Toyota Corolla LE Plus FWD CVT 1.8L I4 DOHCRecent Arrival!Toyota Certified Used Vehicles Details: * Transferable Warranty * Vehicle History * Roadside Assistance * 160 Point Inspection * Warranty Deductible: $50 * Powertrain Limited Warranty: 84 Month/100,000 Mile (whichever comes first) from original in-service date * Limited Comprehensive Warranty: 12 Month/12,000 Mile (whichever comes first) from certified purchase date. Roadside Assistance for 1 YearAwards: * 2016 KBB.com 5-Year Cost to Own Awards * 2016 KBB.com Best Buy Awards FinalistWHY CHOOSE HAMER TOYOTA? SIMPLE - we choose volume sales over large profit margins! Serving the good folks of the San Fernando Valley from the same corner since 1939, we are in the TOP 10 IN THE USA on Certified Pre-Owned Toyotas and every pre-owned vehicle passes inspection or we don't sell it!! Our Service Department is filled with Toyota Master Technicians who care, our Parts Department is fully stocked, we offer a free shuttle during your service, and provide free wifi in our Customer Business Center. Buy from Hamer and receive a 15% Off Parts Card good for life! At Hamer Toyota, WE HEAR YOU! CARFAX One-Owner. Clean CARFAX. Certified. Slate Metallic 2016 Toyota Corolla S Plus FWD CVT 1.8L I4 DOHC Dual VVT-i S Plus Package.Recent Arrival! 29/37 City/Highway MPGToyota Certified Used Vehicles Details: * Roadside Assistance * Powertrain Limited Warranty: 84 Month/100,000 Mile (whichever comes first) from original in-service date * Limited Comprehensive Warranty: 12 Month/12,000 Mile (whichever comes first) from certified purchase date. Roadside Assistance for 1 Year * 160 Point Inspection * Transferable Warranty * Warranty Deductible: $50 * Vehicle HistoryAwards: * 2016 KBB.com Best Buy Awards Finalist * 2016 KBB.com 5-Year Cost to Own AwardsWHY CHOOSE HAMER TOYOTA? SIMPLE - we choose volume sales over large profit margins! Serving the good folks of the San Fernando Valley from the same corner since 1939, we are in the TOP 10 IN THE USA on Certified Pre-Owned Toyotas and every pre-owned vehicle passes inspection or we don't sell it!! Our Service Department is filled with Toyota Master Technicians who care, our Parts Department is fully stocked, we offer a free shuttle during your service, and provide free wifi in our Customer Business Center. Buy from Hamer and receive a 15% Off Parts Card good for life! At Hamer Toyota, WE HEAR YOU! CARFAX One-Owner. Clean CARFAX. Certified. Slate Metallic 2016 Toyota Corolla S Plus FWD CVT 1.8L I4 DOHC Dual VVT-i S Plus Package.Recent Arrival! 29/37 City/Highway MPGToyota Certified Used Vehicles Details: * Warranty Deductible: $50 * Roadside Assistance * Limited Comprehensive Warranty: 12 Month/12,000 Mile (whichever comes first) from certified purchase date. Roadside Assistance for 1 Year * 160 Point Inspection * Vehicle History * Transferable Warranty * Powertrain Limited Warranty: 84 Month/100,000 Mile (whichever comes first) from original in-service dateAwards: * 2016 KBB.com Best Buy Awards Finalist * 2016 KBB.com 5-Year Cost to Own AwardsWHY CHOOSE HAMER TOYOTA? SIMPLE - we choose volume sales over large profit margins! Serving the good folks of the San Fernando Valley from the same corner since 1939, we are in the TOP 10 IN THE USA on Certified Pre-Owned Toyotas and every pre-owned vehicle passes inspection or we don't sell it!! Our Service Department is filled with Toyota Master Technicians who care, our Parts Department is fully stocked, we offer a free shuttle during your service, and provide free wifi in our Customer Business Center. Buy from Hamer and receive a 15% Off Parts Card good for life! At Hamer Toyota, WE HEAR YOU! CARFAX One-Owner. Clean CARFAX. Certified. Super White 2016 Toyota Corolla LE FWD CVT 1.8L I4 DOHC Dual VVT-iRecent Arrival! 29/38 City/Highway MPGToyota Certified Used Vehicles Details: * 160 Point Inspection * Roadside Assistance * Vehicle History * Limited Comprehensive Warranty: 12 Month/12,000 Mile (whichever comes first) from certified purchase date. Roadside Assistance for 1 Year * Powertrain Limited Warranty: 84 Month/100,000 Mile (whichever comes first) from original in-service date * Transferable Warranty * Warranty Deductible: $50Awards: * 2016 KBB.com 5-Year Cost to Own Awards * 2016 KBB.com Best Buy Awards FinalistWHY CHOOSE HAMER TOYOTA? SIMPLE - we choose volume sales over large profit margins! Serving the good folks of the San Fernando Valley from the same corner since 1939, we are in the TOP 10 IN THE USA on Certified Pre-Owned Toyotas and every pre-owned vehicle passes inspection or we don't sell it!! Our Service Department is filled with Toyota Master Technicians who care, our Parts Department is fully stocked, we offer a free shuttle during your service, and provide free wifi in our Customer Business Center. Buy from Hamer and receive a 15% Off Parts Card good for life! At Hamer Toyota, WE HEAR YOU! CARFAX One-Owner. Clean CARFAX. Certified. Black Sand Pearl 2018 Toyota Corolla LE FWD CVT 1.8L I4 DOHC Dual VVT-iRecent Arrival! 28/36 City/Highway MPGToyota Certified Used Vehicles Details: * Roadside Assistance * Powertrain Limited Warranty: 84 Month/100,000 Mile (whichever comes first) from original in-service date * Limited Comprehensive Warranty: 12 Month/12,000 Mile (whichever comes first) from certified purchase date. Roadside Assistance for 1 Year * Vehicle History * 160 Point Inspection * Warranty Deductible: $50 * Transferable WarrantyWHY CHOOSE HAMER TOYOTA? SIMPLE - we choose volume sales over large profit margins! Serving the good folks of the San Fernando Valley from the same corner since 1939, we are in the TOP 10 IN THE USA on Certified Pre-Owned Toyotas and every pre-owned vehicle passes inspection or we don't sell it!! Our Service Department is filled with Toyota Master Technicians who care, our Parts Department is fully stocked, we offer a free shuttle during your service, and provide free wifi in our Customer Business Center. Buy from Hamer and receive a 15% Off Parts Card good for life! At Hamer Toyota, WE HEAR YOU! CARFAX One-Owner. Clean CARFAX. Certified. Slate Metallic 2016 Toyota Corolla LE FWD CVT 1.8L I4 DOHC Dual VVT-iRecent Arrival! Odometer is 10064 miles below market average! 29/38 City/Highway MPGToyota Certified Used Vehicles Details: * Warranty Deductible: $50 * Transferable Warranty * Limited Comprehensive Warranty: 12 Month/12,000 Mile (whichever comes first) from certified purchase date. Roadside Assistance for 1 Year * 160 Point Inspection * Vehicle History * Powertrain Limited Warranty: 84 Month/100,000 Mile (whichever comes first) from original in-service date * Roadside AssistanceAwards: * 2016 KBB.com Best Buy Awards Finalist * 2016 KBB.com 5-Year Cost to Own AwardsWHY CHOOSE HAMER TOYOTA? SIMPLE - we choose volume sales over large profit margins! Serving the good folks of the San Fernando Valley from the same corner since 1939, we are in the TOP 10 IN THE USA on Certified Pre-Owned Toyotas and every pre-owned vehicle passes inspection or we don't sell it!! Our Service Department is filled with Toyota Master Technicians who care, our Parts Department is fully stocked, we offer a free shuttle during your service, and provide free wifi in our Customer Business Center. Buy from Hamer and receive a 15% Off Parts Card good for life! At Hamer Toyota, WE HEAR YOU! CARFAX One-Owner. Clean CARFAX. Certified. Super White 2018 Toyota Corolla LE FWD CVT 1.8L I4 DOHC Dual VVT-iRecent Arrival! 28/36 City/Highway MPGToyota Certified Used Vehicles Details: * Vehicle History * Warranty Deductible: $50 * Roadside Assistance * Powertrain Limited Warranty: 84 Month/100,000 Mile (whichever comes first) from original in-service date * Limited Comprehensive Warranty: 12 Month/12,000 Mile (whichever comes first) from certified purchase date. Roadside Assistance for 1 Year * 160 Point Inspection * Transferable WarrantyWHY CHOOSE HAMER TOYOTA? SIMPLE - we choose volume sales over large profit margins! Serving the good folks of the San Fernando Valley from the same corner since 1939, we are in the TOP 10 IN THE USA on Certified Pre-Owned Toyotas and every pre-owned vehicle passes inspection or we don't sell it!! Our Service Department is filled with Toyota Master Technicians who care, our Parts Department is fully stocked, we offer a free shuttle during your service, and provide free wifi in our Customer Business Center. Buy from Hamer and receive a 15% Off Parts Card good for life! At Hamer Toyota, WE HEAR YOU! CARFAX One-Owner. Clean CARFAX. Certified. Barcelona Red Metallic 2018 Toyota Corolla LE FWD CVT 1.8L I4 DOHC Dual VVT-iRecent Arrival! 28/36 City/Highway MPGToyota Certified Used Vehicles Details: * Roadside Assistance * Warranty Deductible: $50 * Powertrain Limited Warranty: 84 Month/100,000 Mile (whichever comes first) from original in-service date * Transferable Warranty * 160 Point Inspection * Limited Comprehensive Warranty: 12 Month/12,000 Mile (whichever comes first) from certified purchase date. Roadside Assistance for 1 Year * Vehicle HistoryWHY CHOOSE HAMER TOYOTA? SIMPLE - we choose volume sales over large profit margins! Serving the good folks of the San Fernando Valley from the same corner since 1939, we are in the TOP 10 IN THE USA on Certified Pre-Owned Toyotas and every pre-owned vehicle passes inspection or we don't sell it!! Our Service Department is filled with Toyota Master Technicians who care, our Parts Department is fully stocked, we offer a free shuttle during your service, and provide free wifi in our Customer Business Center. Buy from Hamer and receive a 15% Off Parts Card good for life! At Hamer Toyota, WE HEAR YOU! *All Dealer Discounts EXCLUDES LEASES. All advertised prices exclude government fees and taxes, finance charges, any electronic filing charge, any emission testing charge and $80 dealer documentation processing charge. All advertised interest rates are subject to buyer qualification. College grad and military rebates, if applicable, are not included. Hamer Toyota is the best place to find your next Certified Pre-Owned Vehicle. We have an unbeatable selection of quality Toyota Certified used vehicles on our lot, as well as a lot of other vehicles to choose from. Buying a Toyota Certified Used Vehicle means that you are also buying peace of mind since every Certified Vehicle includes an extension of the vehicle’s original factory warranty to help protect you against mechanical failures and breakdowns. Your Certified Pre-Owned Vehicle will also include 1 year of road assistance. Shop for your next vehicle and find the right car for your budget with our Payment Calculator. Once you find a vehicle that you are interested in, contact us to check availability and schedule a test drive. Our experienced sales team will help you through the sales process to ensure that all of your questions are answered. Once you’ve purchased your Certified Used Toyota, our trained technicians will be available to help with all of your vehicle maintenance needs. If you have any questions, please reach out to us at (855) 592-7001. 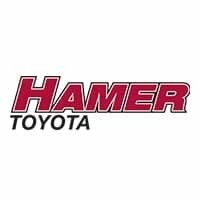 Hamer Toyota prices our Certified Used Vehicles using an online live market tool which compares our prices against identical vehicles in our area. This ensures that you’re getting a great deal without the hassle of having to negotiate. Buyers can use the Real Deal Price Check Tool to find out how the price of the used car they are considering compares against the prices of matching vehicles for sale in our local market area. By using a real time used car price comparison, buyers can feel confident in their purchase price before they sign on the dotted line.